The Definitive "VVT swap into 90-97 chassis" Megathread. - Miata Turbo Forum - Boost cars, acquire cats. The Definitive 1990-1997 VVT Swap Megathread. I've made several posts on this topic, but I've never consolidated all of the information into once place until now. This thread will outline all of the mechanical and wiring tweaks necessary to install a 2001+ engine in a 1990-1997 chassis. This method relies mostly on OEM 1990-1997 wiring, and assumes you will be using a standalone ECU (either an AEM or a Megasquirt of some variety). There are other ways to complete the same task, but this post will outline the methods I've used successfully. I believe that this is the easiest way to complete this swap with the least cost and headaches incurred. In some places, I have added info that is 99-00 specific, but this thread is largely VVT-specific. If you are doing a 99-00 BP4W swap, you'll need to fill in the gaps yourself. Any 1994-2005 motor mount will bolt up to the 2001-2005 block. The 2001-2005 engines used a unique 4-hole mount, but any 94-05 3-hole mount will work in place of these. All 1.8 mounts (94-05) will bolt into the 90-97 sub-frame. All 5 and 6-speed 90-05 transmissions will bolt up to the 99-05 block. You can use any clutch (1.6 or 1.8) as long as you use a matching flywheel (1.6 clutch with 1.6 flywheel, 1.8 clutch with 1.8 flywheel). The starter motors are functionally identical. The NB starter is lighter, so if you have the choice, use it. Use a 1994-1997 alternator and pulley. The 1.6 alternator has a different shaft diameter, so a pulley swap is not possible - the entire alternator must be swapped. It may be possible to use the 99-05 ECU with wiring changes and an ECU with alternator control, but few/no PnP ECUs for 1990-1997s will have this feature, so it's easiest to simply use a 94-97 alternator with onboard control. For 90-93 cars, you will need to enlarge the hole in your factory alternator wire ring terminal, or install a new, larger ring terminal to match the larger 94-97 alternator lug. Use any 1999-2005 intake manifold (VICS, VCTS, or EUDM Squaretop). There are three OEM intake manifold options. The 99-00 "VICS" manifold will produce the most low-end torque (assuming you are controlling the VICS butterflies). The 01-05 "VTCS" manifold is the most common and the cheapest, but it makes slightly less power than the other two options and requires very slight modification to clear the 99-00 fuel rail. 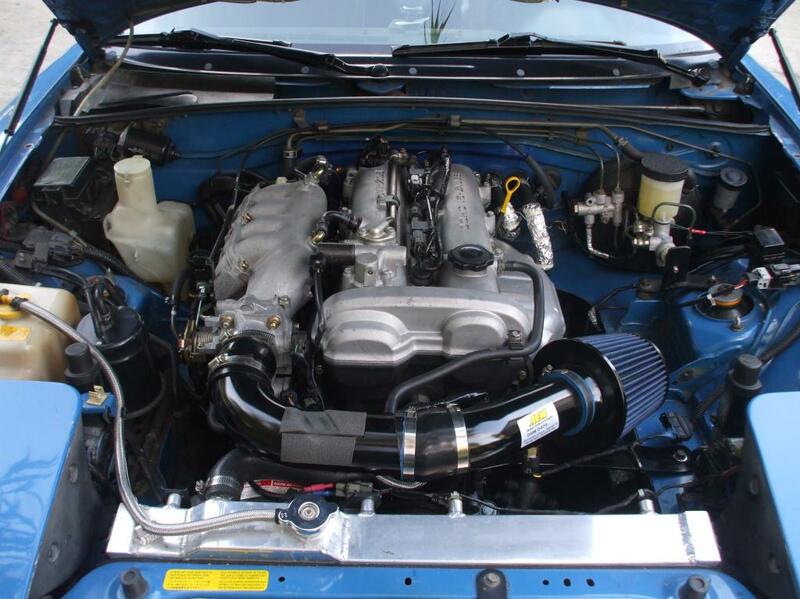 The 02-05 JDM/EUDM "Squaretop" manifold was available overseas and makes more power than either US-market intake manifold, but slightly less mid-range torque than the 99-00 VICS manifold. The 1994-1997 intake manifold will bolt up, but the ports on the 99-05 heads are significantly higher and the 94-97 IM ports are misaligned by 3/4". All three intake manifolds are EGR compatible. The EUDM manifolds came with an EGR valve in Europe, while Japanese market cars were shipped with block-off plates on those ports. All three intake manifolds have the same throttle body location. Any 1994-2005 throttle body can be used, but the 99-05 TB is more desirable for its internal idle valve routing, which makes plumbing for custom 2.5" cold air intakes or intercooler piping much simpler. Using the 99-05 throttle body will require that you change the TPS and IAC valve pigtails, but this is a fairly simple modification. The 1990-1993 throttle body cannot be used on the 99-05 manifold without an adapter, and you lose the benefits of the linear TPS on all 94-05 throttle bodies. Use a 1999-2005 throttle cable. It will bolt directly into the NA chassis and fit perfectly with the NB engine. The NA cable is too long. Any header from 1994-2005 will bolt up to the head. If you are using a 1994-1997 header, you will need to delete the EGR tube and EGR valve, but you will be able to use a cat and catback exhaust from a 1994-1997 (the exhaust hangar locations are the same for 90-97). Using a 1999-2005 header will allow you to retain the EGR tube, but you will need to have a custom cat pipe built to jump from the 99-05 header flange to your 90-97 catback (you cannot use an NB catback without changing several of the exhaust hangars). If you use a 99-05 header to retain EGR, the 2001+ headers flow much better and are significantly more desirable. Use a 1999-2000 fuel rail and a 1990-1993 USDM fuel pressure regulator installed upside down with the fuel outlet bent straight to clear the intake manifold. No other combination of USDM parts will work. The 90-93 fuel rails are too short, the 94-97 rails have incorrect mounting tabs, and the 01-05 rail places the fuel pressure regulator in a spot which interferes with the cylinder head. The 94-97 FPR places the pressure reference in a spot which interferes with the cylinder head and the 99-05 regulators do not have a return line. In Europe/Japan, a return-style 1.8L NB was available, and the FPR from that car will bolt up to the USDM 1999-2000 fuel rail as well. No modifications are needed to install this part, and the return line will face down. The part number is BP5B-13-280. This is a 43.5psi vacuum-referenced regulator (1:1), just like the USDM 90-97 regulators. You will need to retain one of the fuel injection fittings from the 01-05 fuel rail to use as an adapter on the 99-00 fuel rail. I prefer to use a 90* adapter instead of a straight adapter to aid fuel line routing around the alternator. Do not simply slip a fuel hose over the end of the 99-00 fuel rail - it will not stay in place. Use 5/16" fuel hose to run from the feed line to the 90* fuel injection adapter and into the fuel rail. For the return, install the 90-93 FPR upside down in place of the OEM 99-00 fuel damper (fuel outlet facing up). Use 5/16" fuel line to run around the back of the intake manifold and into the return line on the chassis. The fuel pressure will be 43psi with a pressure reference, just like the 1990-1993 fuel system. Alternatively, you can use an aftermarket fuel pressure regulator. The stock VVT fuel rail can be used if the factory fuel damper is replaced with an adapter and used in conjunction with an aftermarket fuel pressure regulator. Use the 2001-2005 coils and wires. The VVT oil feed line interferes with the 1990-2000 coil mounting location. The 01-05 coils are fairly reliable and easy to wire up. You must use the NB cam and crank angle sensors if you want VVT control. There is no way to control the VVT if you use an NA-style CAS driven from the exhaust camshaft. The OEM 1990-1997 CAS has 4 wires. One wire is +12v, one wire is a sensor ground, and there is a signal wire for the crank position and a signal wire for the cam position. You will need to cut the factory plug off and extend the +12v and ground wires to each of the NB sensors. The cam signal wire will get routed to the camshaft sensor on the top of the valve cover, and the crank signal wire will get routed to the crankshaft sensor located near the harmonic damper. This will bring the appropriate cam and crankshaft patterns along the OEM harness into the ECU, and all of the other changes necessary will happen in the firmware/software of your ECU. If you are swapping to the 99-05 throttle body to upgrade to the internally routed IAC valve, you will need to swap the pigtails for the TPS and IAC wires. The IAC valve wiring is not sensitive to polarity, so you can simply swap the pigtail without worrying about which wire goes where. The 90-93 manual chassis did not originally come with a 0-5v variable TPS. To use a 94-05 0-5v throttle position sensor in a 90-93 chassis, consult with your ECU supplier to confirm the wiring changes that are necessary. The VVT solenoid is a 2-wire PWM solenoid, just like an EBC valve. There is no polarity on the wires. Connect one wire to +12v (the injector harness is very close and has plenty of extra current room on its fuse) and the other wire directly to your ECU's VVT control pin. The wiring modifications for the coils are chassis-specific. The 01-05 coils have no provisions for a tachometer output. The MS Labs MS3 Basic, AEM Series 1 (30-1710), AEM EMS-4 (30-6905), MSPNP2, MS3-Pro, and all 94+ MSPNP1s have a tachometer driver which will run the factory tach in lieu of the factory coils. For 90-93 MSPNP1 owners, you will need an aftermarket tachometer driver, which can either be added to your ECU or purchased and wired separately. See posts 44 and 62 for more details. Most people elect to switch to sequential fuel while doing this swap. The factory 1990-1993 cars (except for California-emissions 1993 cars) have fuel injectors wired in pairs (1/3 and 2/4). I typically elect to run new trigger wires for injectors #3 and #4 and leave the OEM trigger wires in place for cylinders #1 and #2. Simply cut the trigger wires (Yellow and Yellow/Black) at the #3 and #4 injector pigtails, heat-shrink the loose ends on the harness side, and attach/route two new wires directly from your ECU to the trigger wires for injectors #3 and #4. Terminate all loose wire ends. Use your factory 94-97 injector harness. No modifications are necessary. The 90-93 cars have two coolant temp sensors and a thermo-switch. The two-wire sensor on the back of the head is the sensor that provides the ECU. The one-wire sensor on the back of the head provides signal to the gauge cluster. The one-wire switch on the front of the engine switches the fans on and off. The 1994-1997 cars have the same two sensors on the back of the head, but the OEM ECU controls the fans instead of a separate thermo-switch. Install your 1990-1997 2-wire ECU coolant temp sensor and your one-wire gauge coolant temp sensor in the 2001-2005 engine. This will allow you to retain your OEM CLT sensor pigtails. The 01-05 engines have a small plug in the hole used by the one-wire gauge sender - simply remove the plug and install the sender in the 01-05 engine. The front thermo-switch (90-93) is no longer necessary, as your ECU will control the fans. First post reserved for update log. Last edited by Savington; 03-20-2018 at 01:18 PM. Nice work Sav, this will help me a lot soon. Remove Mazda igniter & plug. We’ll be re-appropriating its wires & discarding the igniter in the steps below. Clip the Mazda brown/yellow wire & the Mazda white wire. Crimp them together. Clip the Mazda brown wire and the Mazda red wire. Crimp them together. Clip the Mazda black/white wire & the Mazda yellow/blue wire. Crimp them together. Clip the Mazda black wire & run it to the black wires at the 01-05 coil pigtails. This is ground. Secure the leftover Mazda blue wire to prevent a short- it is 12V. coil pigtails. This is 12v. The white wire runs the coil for cylinders 1&4. Connect it to the brown/white wire at the 1&4 01-05 coil. The red wire runs cylinders 2&3. Connect it to the black/yellow wire at the 2&3 01-05 coil. I think they're the same, but I haven't read through them both completely. I did however follow the above instructions on a '90 and it worked perfectly. It does result in having ZERO tach. It'll require you to use a tach output pin on your standalone ECU (I'm assuming we all have one by now). And as another note, the gen1 MSPNPs did NOT have this output pin. Either send it to DIY for $75 and they'll solder in the necessary components, or buy your own bits and google how to do so. There is a drop down menu for a tacho output pin in tunerstudios, but the circuitry is not there. Install your 1990-1997 2-wire ECU coolant temp sensor and your one-wire gauge coolant temp sensor in the 2001-2005 engine. This will allow you to retain your OEM CLT sensor pigtails. The 01-05 engines have a small plug in the hole used by the one-wire gauge sender - simply remove the plug and install the sender in the 01-05 engine. The front thermoswitch (90-93) is no longer necessary, as your ECU will control the fans. Protip: Do this while the engine is out of the car. Doing it while the engine is in the bay is a colossal pain in the ***. Subscribed... Thank you very much! I wish I would have read this yesterday so I could have grabbed the throttle cable off the car I pulled the engine from. Edit: In looking around at the coil wiring information from a VVT engine, it seems that the logic/trigger wire colors are brown/white for coil 1 and black/yellow for coil 2 source 1 source 2. It's brown and brown/yellow for 95 source. Unless I've misunderstood something? Last edited by Morello; 08-18-2014 at 12:02 PM. Most people elect to switch to sequential fuel while doing this swap. The factory 1990-1993 cars (except for California-emissions 1993 cars) have fuel injectors wired in pairs (1/3 and 2/4). I typically elect to run new trigger wires for injectors #3 and #4 and leave the OEM trigger wires in place for cylinders #1 and #2. Simply cut the trigger wires (Yellow and Yellow/Black) at the #3 and #4 injector pigtails, heatshrink the loose ends on the harness side, and attach/route two new wires directly from your ECU to the trigger wires for injectors #3 and #4. Terminate all loose wire ends. Thank you very much for this. I was wondering how to convert my 1991 wiring harness to take advantage of the sequential fuel injection capabilities of my MS Labs Basic MS3. Your explanation is straightforward and easy to follow. Even though I have the FM 36-2 timing wheel I've elected to keep my '90-'93 coils for ease of use so I still stuck with wasted spark for now. Sequential spark is a nice improvement for guys who are running into the dwelling limits of high-performance coils when running them in a batch configuration, but especially in N/A applications it's not a must-have thing. Sequential fuel, OTOH, improves fuel economy and driveability and is IMO a must-have thing. Agreed. Sequential fuel injection is a must, sequential ignition is a nice to have but not really necessary on a naturally aspirated motor like mine. Eventually I want sequential fuel and spark, per-cylinder knock detection and EGT probes in each exhaust runner so I have a near complete picture of what's going on inside each cylinder. Thanks a bunch for this man, I specifically became active here because of how useful these posts have been in my swap. Thanks for consolidating all of this information, I'm sure it will be useful as I am doing one of these swaps now! When deleting the ignitor on a 90-93 car, do you typically cut off the connector and solder or crimp to the wires directly? Or is there a source for the other end of that plug with new wires on it? Just trying to gauge how much cutting and splicing needs to be done. I typically cut and crimp. AFAIK the ignitor side of that connector doesn't exist. On the '95 models (this maybe true of all 94-97, but I can't verify it) you can use the wiring from the solenoid mounted to the intake manifold for the FPR for convenient power for the VVT solenoid. It has a 12v+ and a trigger wire. Just repin the wire on the ECU side to where you need it. Subbed, have a VVT motor in the garage waiting for my 90 that is on loan (long term storage) to my parents. I went with AEM-4 and got good tech support from TSE, thank you Sav ! This is all over the place. AIT tapping really should be included in stand alone's instructions, so it doesnt need to be here.